A discontinuity ? How’s it even possible ? According to the Internet Space Marines are THE worst army in Eighth Edition. I am planning to bring my Ultramarines to a large GT in SoCal next month. I have been practicing with my army since I first started to build it over a year ago. In my opinion while Bobby G gun-line is no longer a thing (which is a good thing) Space Marines are still okay and can get the job done. Sure they are not top tier but what about players that want to play what they love and do well with it. The GT I’ll be attending is using the ITC Missions which is pretty much all I play. I have heard SoCal is a meta for 40k but I come from the east coast. I look forward to facing off against xenos and Knights. I should mention I have some allies but Ultramarines form the bulk of my list. I will post some more leading up to the GT plus a report on the event. The quintessential leader of Deathwatch killteams. McBane has been resurrected once again and reprogrammed with a fresh new killcode. Deathwatch was released just prior to Imperial Knights then seem to have been forgotten. 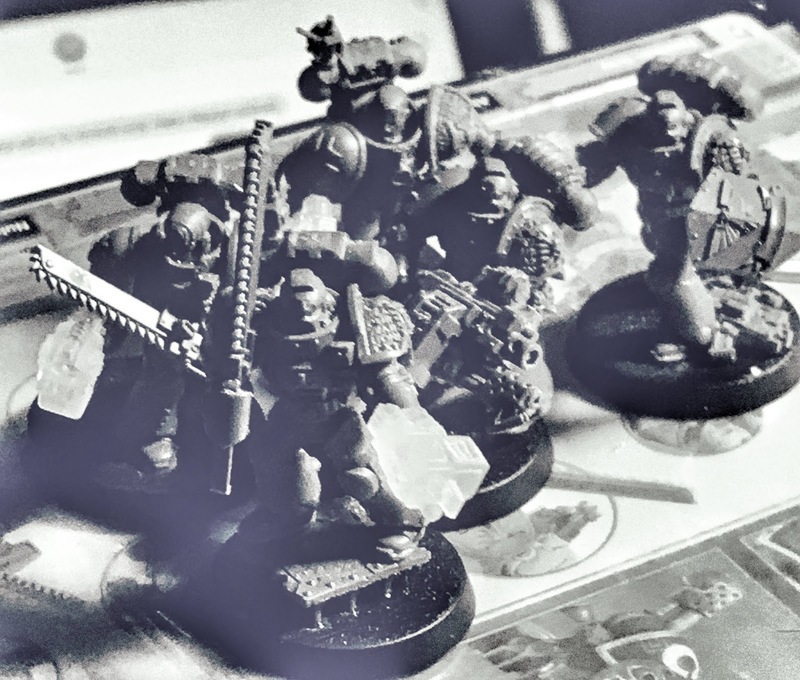 Several prominent competitive players stated prior to that they thought Deathwatch is solid and can go the distance shortly after their official release. So since then they have slipped back into anonymity and honestly you never seem to really hear anything about them anymore. Is Deathwatch truly competitive now that the dust has finally settled? My answer is yes they are but they require tactical play and need an ally to shore up their weaknesses. 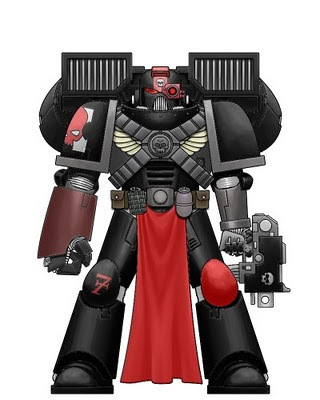 I would even go so far to say Deathwatch is currently the best all around Space Marine army right now. Personally I have no plans to play Knights with my army because I like to avoid crutch units, which is what they are in my mind. If you watch video Battle Reports you might come away with the feeling Knights are nigh unbeatable and the games I’ve seen that featured the newly released Deathwatch just can’t seem to win. The thing is it doesn’t have to be that way. Consider that Deathwatch has some solid core units, great stratagems and some fantastic wargear. So how to put it altogether is the question. These two units are your core troops (objsec) and they are both quite solid. Veterans have access to some unique special weapons such as the frag cannon and a lot of really good options. Their bolt weapons have Special Issue Ammo (SIA) which offers a plethora of versatility - Vets can quickly bolter down a lot of of tough enemy units. Think of Vets as Sternguard on crack due to the various types of superior SIA rounds plus other options such as spamming chainswords for those sweet sweet extra attacks. For example Hellfire rounds automatically wound on 2+ and depending on what slot the target enemy units comes from the Vets are rerolling 1s to wound... that’s really really good. Stick them beside a Watchmaster and they are rerolling misses too. There are means to change the chosen enemy slot such as using a stratagem - for example you can first focus fire on enemy troops to sweep aside chaff then later switch to enemy elites. My current build is four veterans with stormbolters and chainswords, Watch Sergeant with a power axe and stormbolter plus another veteran with either a frag cannon or Infernus Heavy Bolter. One of the Vets replaces his chainsword for a stormshield for some much needed resilience. There are many good builds though, this is just one example. Add a Black Shield and the killteam CSM suddenly heroically intervene. Primaris killteams have the option to mix various models from different units and gain extra abilities. Primaris killteams also have access to SIA... Bolt rifles at AP2 for example. My current build is a five man Intercessor squad which is mandatory and attach two plasma Inceptors. There’s some good strong synergy here for sure. Plasma is always a good thing which shores up one of the major drawbacks to fielding Intercessors. The Watchmaster is must take and functions similar to a Chapter Master plus he sports a Guardian Spear (think Custodes). Watch Captains have access to some very powerful wargear, relics and Warlord traits for the super buffs. My favorite combination is jump pack, Thunderhammer, stormbolter, Castellan of the Black Vault (Warlord trait) which makes a weapon +1 damage plus inflict mortal wounds on rolls of 6 to wound, plus Bane bolts (relic) which also inflict mortal wounds and has access to SIA as well... this is ubër Captain Smashfucker. I think a Librarian is a solid third pick if you’ve got the points left over for psychic defense and Smite; I’d equip him with a jump pack as well for the mobility. So these units form your core for a battalion. Run this with another battalion such as Blood Angels and you’ve suddenly got 13 command points to start the game which is not shabby. I have to mention the Leviathan dreadnaught armed with two storm cannons and two heavy flamers... it can potentially delete an enemy unit per turn plus you can use a stratagem to place him in deep strike reserve to ward off enemy alpha strikes. You’ll need another heavy support - my go to unit is the quad launcher - it doesn’t need line of sight to target enemy units and is excellent for clearing out more chaff. I’d like to write more articles on Deathwatch and would like to know what types of topics you’d like featured. Here is the first squad done. One more to go then a Primaris squad. Here’s my Sergeant for my first veteran squad. He is armed with an eviscerator from the assault Marine kit so it could represent a variety of melee weapons such as a power axe or power fist. You can see the details of the stormbolter better now which is from Pop Goes the Monkey - fantastic kit ! "This is the dead body of the daemon Prince Angron, former Primarch of the World Eaters originally known as War Hounds." said Orpheus. "I can’t even begin to imagine what slew him. Tyranids would be no match for him. Angron was subpar and wasted his Legion as did all the other Traitor Primarchs, embedding the dark nails of pain into their brains thus erasing any vestiges of martial honor they had left. Angron slew all of his Captains upon being first introduced to them except for Kharn whom was only spared by the dark gods. They fight as small war bands at most now. Their legacy is a stain upon all decency." Orpheus scoured the immediate area beside the rotted husk. "Look... there’s one of his axes." He pointed to a huge weapon laying upon the ground. The hilt was very long and many highly detailed runes had been intrinsically etched into the bronze. "It’s teeth were taken from a fabled Mica Dragon." Stowing his pistol the Templar got down on his knees grabbing the hilt with both hands. Slowly he curled it up to his chest. It felt so heavy his biceps bulged and sweat broke out upon his brow. Lifting the heavy head he brought it down in one fell swoop obliterating the remains of the malformed being. "Now we must return to Terra." Here’s my new Captain I kitbashed this evening... can’t wait to paint him ! Orpheus lead the remaining Templars through a dark tunnel. The Tyranids had been vanquished, the brawl was over. 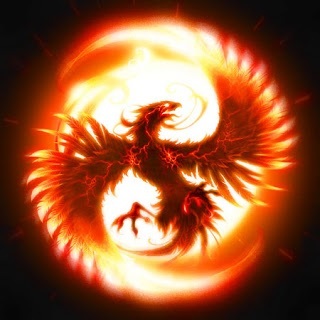 Bits of bleached bones and broken skulls picked free littered the floor beneath them crunching into pale white dust as their armored boot soles tread over them. One of the surviving Sword Brethren held up an electric torch with his remaining arm illuminating the path ahead. Sigils of corruption had been painted in blood covering the walls and a grotesque pantheon of skulls had been nailed in place. Some skulls were xenos in origin such as the eldar while others were human. 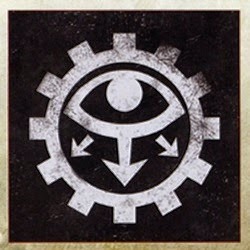 Orpheus noticed many of the sigils were Khornate but there were plenty others to represent other denizens of the warp. He felt the Hellblade growling as he sheathed it and reached for his artificed bolt pistol, slamming a fresh clip into the magazine. All was silent except for the constant crushing of bone. They came to a terminus blocked by a hinged heavily armored door embedded into the tunnel. The champion motioned to a Techmarine whom came forward carrying a heavy lascutter. Igniting the tip the adept began to slowly cut through the outer hinges. Blue sparks showered the air as the rest of the party hung back watching him complete his task in utter silence. Finally he was done, storing the lascutter and then a lone terminator strode up behind him. Revving his chainfist the Sword Brethren punched into the center of the barrier easily carving it apart. The ruined doors slid apart clanging against each other as they crashed down. Orpheus was the first to step across the boundary and enter the inner sanctum. Inside the air was fetid and smelled of fresh offal. Waves of pungent trapped atmosphere poured out back into the tunnel behind them. Fitting a rebreather across his nose and mouth the champion stepped towards the center of the forbidden chamber. Something huge and humanoid in form lay crucified against a large fallen brass symbol representing the eight limbed star of Chaos. Its Crimson armor was broken in many places, fragments of bone jutting out from some of the rusted rents. "By the holy Emperor." mouthed Orpheus as he looked up to see the gigantic swollen skull protruding from the broken face plate of the cracked crimson helm. Long links of mechatendrils spilled from the top of the skull and its metal teeth still gnashed against each other. Prodding the fallen armored body with his boot Orpheus watched carefully for any reaction but other than the constant chattering of its teeth it remained inert. "Scour the area." commanded the champion. Check them out at Conversionworld.de (you’ll have to cut and paste the link, well worth it). Three more to go now.